Our Nursing Staff are caring and experienced – they truly make The Center your home. We offer 24-hour skilled nursing care to provide closely supervised support for residents who require assistance with their activities of daily living. This care ranges from medications, bathing, walking, dressing, eating and oversight. Our nurses also offer support for medications, feedings (G-Tube, Nasal Gastric), wound care, bladder scanning and nursing oversight while a resident is transferred to doctors’ appointments. The Center conveniently offers its residents all laboratory and radiology (X-Ray) services. The resident doesn’t even need to leave the room. The Center provides diagnostic dental services for all residents regularly repeating these services to ensure that dental problems do not occur. If there are issues, we transport the resident to any of three dental groups we partner with. Every resident has an individualized dietary plan based on the needs of the resident including special dietary requirements, allergies and restrictions. Our in-house dietician is skilled in determining the best nutrition plan for each resident. An on-site Medical Director oversees patients and three other doctors from local medical groups come in weekly for progress reports and check-ups. We also provide psychiatric services once a week to provide any mental health services needed. When residents are passing on, The Center is part of the process and part of the family. 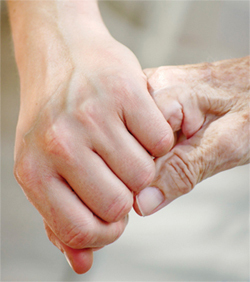 Our hospice services provide special nursing, clergy, medical support and pain management. It is extremely important to us that comfort and support is offered to the resident and their families. As a family, we mourn and celebrate life too. Each season we have a Celebration of Remembrance service for those who have passed on at The Center. Please join us for the Celebration of Remembrance. It is posted on the Activity Calendar or you can call the Activity Department at extension 136 for more information.